The remains of homes hit by a massive tornado are seen in Moore, Okla., Monday, May 20. Homes in the direct path of the monster tornado that roared through Oklahoma City suburbs Monday were all but certain to be destroyed. Yet inexpensive construction techniques could have kept up to 85 percent of the area's damaged houses standing, according to a civil engineer. "You need several hundred of them in the house, but it is not anything drastic, it is not a humongous expense, it is relatively inexpensive," he told NBC News. For about $2,000 more, a house can be outfitted (or retrofitted) with a safe room built to specifications of the Federal Emergency Management Agency (FEMA). These fortified rooms, often constructed with cinder blocks and filled with mortar and rebar, can withstand tornado-force winds and storm debris. "Lower wind speeds, you design to protect your house and higher wind speeds you design to save your life," Graettinger said. "Unfortunately, you have to do them both." The total cost is the equivalent of installing granite countertops or a whirlpool tub, which many homeowners opt for without a second thought to make their homes look nice and raise their value. They could — and are beginning to — opt for the tornado proofing as well, Graettinger noted. The National Weather Service initially rated Monday's storm as an EF-4, the second strongest type, with winds of 166 to 200 mph. Most — if not all — houses in its direct path were splinted to pieces. Any storm in the top three categories, with winds at least as high as 135 mph, is strong enough to break apart wood "and at that point, a wood home is going to come apart," Graettinger said. Even steel structures are vulnerable in those conditions, noted Curtis McCarty, a home builder in Norman, Okla., who is on the state's Uniform Building Code Commission. "If you are above ground and you get hit in a storm like that, no matter the type of construction unless it is a concrete-reinforced structure, you are probably not going to have anything left," he told NBC News. But the EF rating, Graettinger said, represents "the worst sustainable section of the storm." He and his colleagues found that during the 2011 tornadoes in Tuscaloosa, Ala., (EF-4) and Joplin, Mo., (EF-5) about 85 percent of the homes were in areas with winds ranked at or below EF-2 – 111 to 135 mph. "All of those homes, 85 percent of the area, could have experienced much less damage," he said. The clips and straps recommended for tornado-proofing work by keeping the walls attached to the roof. "You are going to be able to hold the assembly of the house together better," explained McCarty. But there's nothing remotely affordable, he added, that can withstand an EF-3, EF-4, or EF-5. 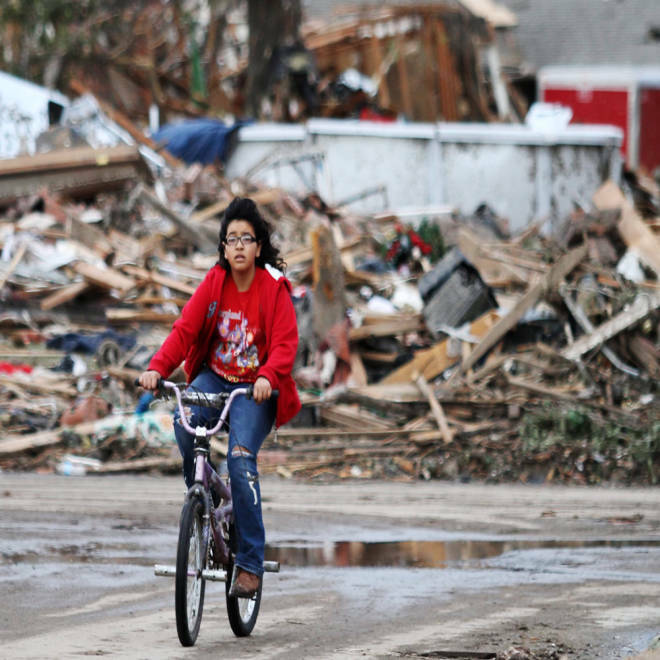 Exotic materials such as carbon fiber found in bicycles and Kevlar, the material used in bulletproof vests, could be used in storm shelters to project people from devastating tornado winds, according to TechNewsDaily. The advantage is an ability to bend with the wind, reducing chances of being toppled. But such futuristic materials are expensive and impractical for the masses, noted Graettinger. What's exotic, he said, is that the building industry is beginning to design for tornadoes with the understanding that well-constructed homes on the fringe of even the most devastating storms can survive. "The next step is to optimize some of these designs with more creative and exotic materials, which will come in the future," he added. "But I think we should stick with what we know works, is proven to work along the Gulf Coast … that would be a huge step forward."